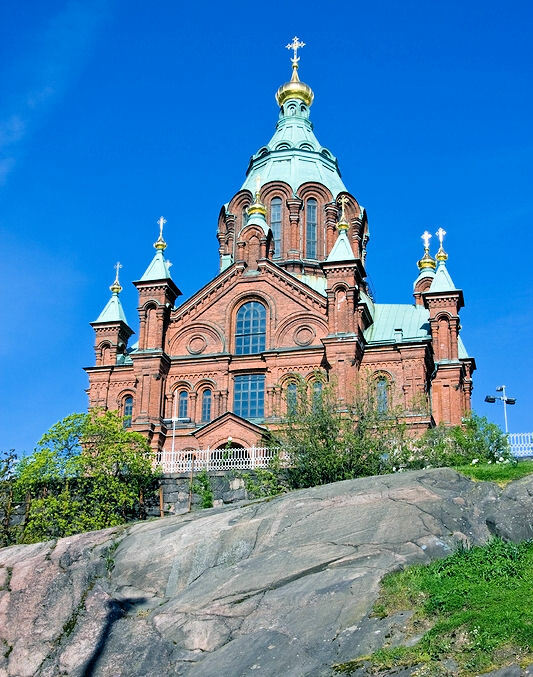 We start the tour along Helsinki’s southern shores and see the hobgoblins of Jugendstil architecture and other features inspired by folklore. From the embassy district of Kaivopuisto there is a splendid view towards the Suomenlinna sea fortress built for Helsinki’s defence. The tour continues via the Imperial Senate Square to the Temppeliaukio Church dug into the bedrock once barred by the Ice Age. From this “must-see” sight we continue to the birthplace of Finland’s oldest habitation, just south of the Salpausselkä ridge. At the Mallusjärvi culture area we will be greeted by the sculptors Virpi Kanto and Tapani Kokko. Their art takes physical form as cast concrete and wood sculpted with a chainsaw. We will visit their studios, sculpture park and perhaps enjoy a cup of coffee and buns in the courtyard of the artists’ home by the lakeside. We return to Helsinki through beautiful countryside scenery. On the way we stop at an area of potholes sculpted by the Ice Age 10 000 years ago. Here you can see one of the largest potholes in the world, “Jättiläisen kuhnepytty”, or the Giant’s Bathtub. There is also a wishing pothole, where you can make a wish to the age old trolls. While waiting for your wish to come true, we still have time to stop at the mediaeval greystone church of Sipoo dating back to the mid 1400s.